Observed in Kitale, Kenya, March 2013. Length is about 4 mm. It is on a leaflet of Schrebera. 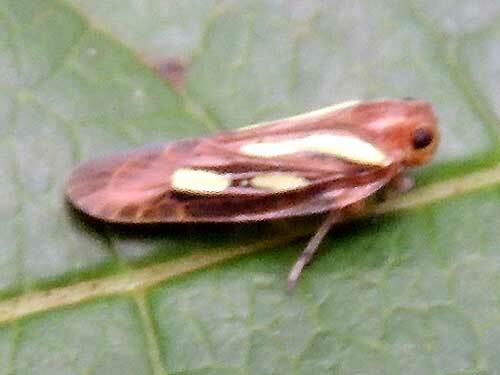 Leafhoppers are a very large group of insects comprising thousands of species. Some are brightly colored while others are cryptic in the pattern. Their bullet shape is highly aerodynamic allowing these bugs to slice through viscous air once the third pair of legs lets loose a saltatorial kick. The eyes are conspicuously large. 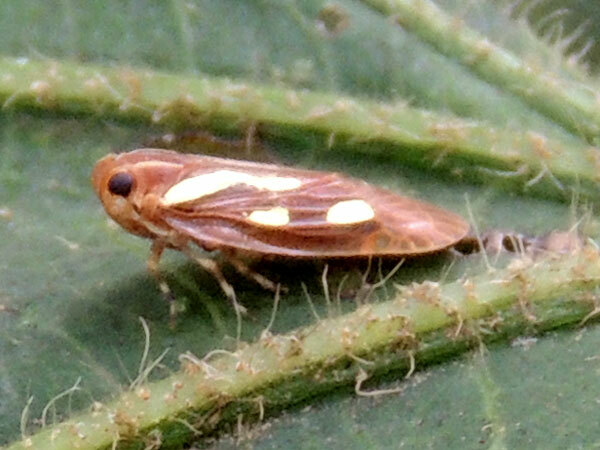 Leafhoppers, like all true bugs, feed by inserting their stylet mouthparts into plant tissue and with a powerful pump extract the phloem and other plant fluids. This is analogous to the feeding mechanism of mosquitoes, and like mosquitoes they can vector diseases - in this case plant pathogens, harmless to people, but potentially devastating to farmers. Absent disease the damage may appear like minute, pale stippling on the leaves or wilted growing tips. Because the bugs are so small, they might go unnoticed except for their signs. Observed near Kaptumo in the South Nandi Forest,Kenya, April 2013. With probably thousands of leafhopper species in Kenya I am surprised to encounter the same species again 200 km distance. This one is on foliage of a Dombeya sp.